Checking the area around Bill’s logical northern exit route if his phone had pinged at Quail Wash.
Impressions of Area and Findings: Easy terrain and pretty in spots. Decent in open areas; not so good elsewhere. As in other areas further south, the area around Quail Wash is dotted with cacti and underbrush; hard to examine thoroughly. After three months to think about it (and also to get into more fighting trim), decided to come back and follow up on the idea that Bill might have pinged in Quail Wash and headed north because, why not. 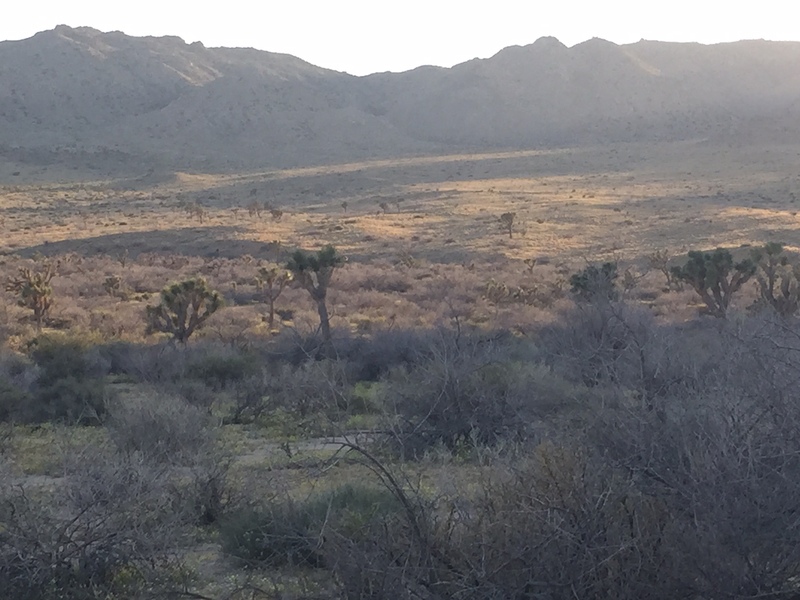 Not wanting to repeat the slog down to the Quail Springs area from Park Road (ever again), I tried a new entry point, on the north end of the wash where it hits the south edge of Joshua Tree village. As it happens, this worked great. There is a parking spot and gate there and it was an easy walk in to the park. Tom has previously been in this area on JT25 and JT38 (I didn’t cotton to the latter search until I got back, and unwittingly duplicated part of it), and his rough conclusion was that Quail Wash saw enough traffic that it was unlikely Bill would have not been found here. From my entry point up until about half a mile below the JTNP boundary (which is the general area of Tom’s previous searches), this was definitely the case. South of that point, however, the wash showed very little signs of visitation. I was intrigued by a large bowl valley just south of the boundary, and spent some time wandering around here on my way back, but there is so little cover here that it’s doubtful Bill would have been drawn in this direction, even though there was a draw that might have looked better than the narrower canyon mouth of the north side of the wash (and Tom covered a lot of the same terrain on JT38). However, if Bill was off his head and wandering blindly as some have speculated, this area and others nearby would have offered plenty of space to get lost in. More intriguing (and not as far as I know covered on previous searches) was the area further south, closer to the mouth of Smith Water (though I did not go that far) and the putative ping site. For the first time in many searches, I felt a quickening of the pulse as I checked out a couple of sheltered areas in the rocks on the west side of the canyon. It did indeed seem plausible that Bill might have wound up here, exhausted on his trudge uphill towards Joshua Tree village, and I think the sides of the canyons and the rocky outcroppings and trees around Quail Wash south of where I was today deserve a closer look. I’m on record as saying I don’t think Bill is in the park to be found, and that I think it’s more likely something unusual and different from a typical lost hiker scenario happened here. This has come up on Reddit and elsewhere, and the objection – quite rightly – has been that it’s impossible to rule out Bill being here somewhere just because we haven’t found him; it’s easy to miss human remains. That’s absolutely true and I have to repeat again that my feeling that something hinky occurred here has little to do with not finding Bill (except that he wasn’t at Upper Covington, the only other semi-logical spot to me), and a lot more to do with not being able to construct a plausible scenario that puts him on the 10.6 mile line at that particular time without him being pinging the tower earlier and/or being found very shortly thereafter. The topography and distances just don’t line up. Bill goes for a day hike up Quail Mountain. He attempts a bushwhack loop back to his car, gets turned around and quickly gets into trouble somewhere in the high country. (It had to have been up high because he was able to survive so long on so little water, which indicates the cooler windier high altitudes, and also because he was held up for a couple of days but still was able to move somewhat quickly once he got down into the flat area…however it had to have been low enough to be out of the cell coverage area around Quail Mountain). 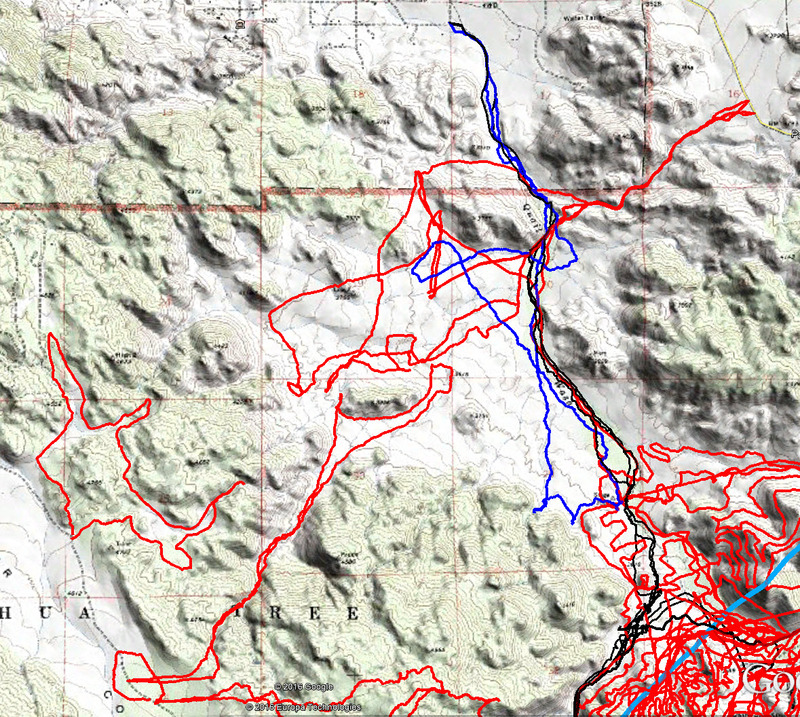 Bill gradually makes his way down into Johnny Lang Canyon, and heads north into Quail Wash.
Bill’s phone pings at 10.6 miles in Quail Wash, at a known spot of reliable reception and right on his logical route. Bill’s phone MUST have crashed the battery at this point, because otherwise he should simply have been able to call for help. (This is the first difficulty with this theory). Bill then proceeded north up the wash, but searchers didn’t enter Quail Wash area near the ping until two days later. This would be a logical route out of the park assuming Bill knew where he was going, since it leads to Joshua Tree village (however, a left turn might have taken him to water in Smith Water Canyon, and a right turn would have gotten him to Park Road slightly faster, but he did neither as he would almost certainly have been found in either case). Bill then at some point leaves the wash, and either expires in a shaded area close by, or wanders off into one of the fairly easy side canyons/bowl valleys on the left or the right of Quail Wash. This theory tracks to me because it does NOT require Bill to climb any height of land, most especially the north side of Smith Water, which should have been well beyond his ability at that point. It keeps to topographical logic all the way from Quail Mountain. It also (kind of) explains how Bill might have been stuck in a proscribed area for a few days and then moved more quickly after that. It does require Bill’s phone to immediately die when it pings (and for him to have fired up his phone in that unlikely spot in the first place), and for him to have moved far enough from that well-traveled spot that he’s not subsequently found. I have a problem with both these points; this is why I didn’t take Quail Wash as a ping site very seriously prior to now. But this scenario is at least plausible to me, and after seeing Quail Wash in the area, I can imagine Bill either expiring somewhere not far north (but out of immediate side of the wash) of the mouth of Smith Water, or (less probably) wandering off the wash a little further north. And I don’t think that particular area of the wash gets enough traffic to rule it out. My basic feeling is still that Bill’s disappearance is not what it seems, however, for the first time in a while, there’s a place to look that doesn’t feel like a total longshot, and moreover it’s easy to get to and quite nice in spots. So, maybe. I will probably be back, and it’s ripe for a look from any other hikers who might want to give it a shot. GPS mileage for this trip: 9.1 miles. JT82 GPS tracks are shown in dark blue. Tracks from the original search are shown in black and searches since then are shown in red. The light blue line is the 10.6 mile radius from the Serin Drive cell tower.